Sharing is a hot topic for little ones. Here are some tips to help your child learn to share. There I was. I was sitting watching my cute little 18 month old son play with a new friend. I was so proud of him. This little boy of mine was so sweet and obedient. He had never even had a hard time sharing! He didn’t mind it at all. I was mortified! How could my sweet boy that I spent so much time with, working to help him be a great citizen, just not share? My brother-in-law’s father was there, and he said something I have never forgotten. He said in order to really share, the child has to first feel possessive over an object. What wisdom! Your toddler isn’t really sharing until he feels possessiveness over objects, and that doesn’t usually happen until somewhere around 18 months. Children who have older siblings or are around children often will likely be possessive earlier than 18 months. Children learn to defend their property if they want to keep it. A lot of times, parents don’t want to require their child shares. They want the child to choose to share; they believe this will make the sharing more meaningful. We have to practice principles before we can believe in them. 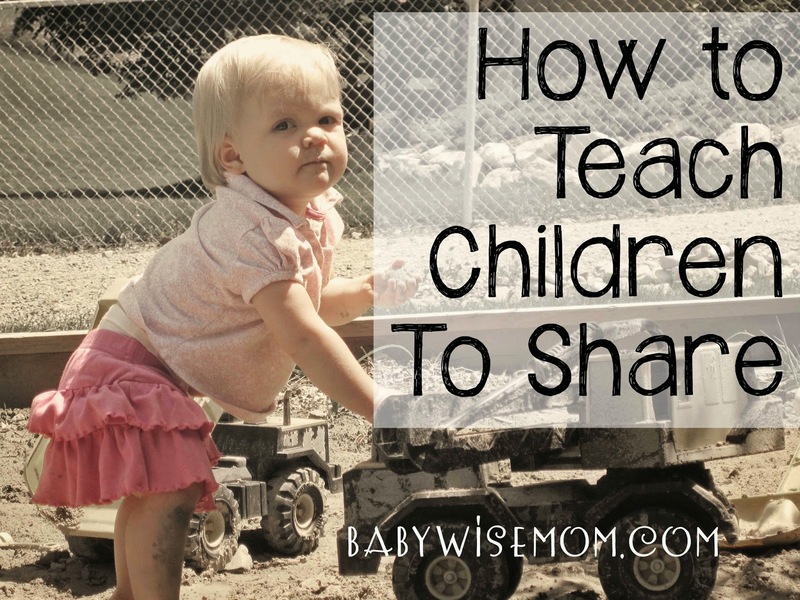 Practicing sharing will help your child learn to share. It will show your child that sharing isn’t the end of the world, life goes on, and maybe even that sharing can make you feel good inside. For more, see Moral Training: Actions Precede Understanding. You will always have more success in training your child if you teach your child the concept when it isn’t in the heat of the moment. When you are at home, practice sharing. Have your child share with you or an older sibling (if the older sibling is able to knowingly help teach the concept). Talk about how you share, how you take turns, and that it is nice to share. Practice sharing and taking turns. Talk about how happy you feel when your child shares with you and how happy your child must feel for being kind. For more, see Training in Times of Non-Conflict. Do not allow your two year old to grab whatever she wants from you when she is playing with you. Sure, you don’t mind, and sure, she is a kid, but how do you insist certain manners with friends when you don’t with yourself? Your child will benefit from practicing sharing even with it is with a person who doesn’t care about what is being shared. We really don’t like to hear little tantrums. No one likes it. Do not allow your youngest child to roam the house screaming for things and getting it immediately. Exhausted parents often sigh, “Can you please just give it to her?” That does not teach your little one to wait her turn to share. It teachers her to throw a fit in order to get what she wants. My two oldest actually have had to be coached into not giving in to Brinley screaming for things. She screams, they respond the way she wants them to. I have had to teach them that it is okay for them to say no to her when she is screaming. Conversely, do not allow the older siblings to dictate what is played with by whom. When Kaitlyn was almost 1 and Brayden was almost 3, I would allow him to take the toy she was playing with so long as he gave her something else to play with. She didn’t mind at all. The problem is, babies get older and get possessive! Another problem is that peers won’t go along with things like a little sister will. Instead, teach the older child that the baby has that toy and he can have it when her turn is over. I love the Daniel Tiger episode on sharing. You can go here: http://www.pbs.org/parents/daniel/episodes/ and scroll down to episode 110. There is a catchy song. When Brinley has a hard time sharing, I sing, “You can take a turn, and then I’ll get it back!” She shares 100% of the time after I sing that song. A timer is a great way to help children know their turn is coming. Use an amount of time that is short enough for children to be patient but long enough that the child playing with the item actually gets to play with it. For me, the child whose turn it is doesn’t start timing the “turn” if the child waiting for the turn is following the other child around and screaming, crying, or otherwise harassing the child about wanting the item. The turn doesn’t count unless the other person is able to enjoy the turn. If your child has something that is hard for him to share, I think it is wise to put that item out of sight when a friend comes over and to not take that item to playdates. Ideally, I think you work on being willing to share everything, but we need to do take small steps with children. Forcing sharing favorite items can create a big scene you will need to discipline over. Work on sharing other things first and help your child recognize the benefits to sharing. Another thing, some children tend to destroy items. There is no reason to force your child to hand over a favorite item to be destroyed. As sharing is practiced, the day will come your child will be able to share all things (within reason, I am sure there will be things that are not something that get played with by everyone). Talk with your child about how she feels when someone doesn’t share with her. Does she feel sad when her friend or sister doesn’t share with her? How does she think it makes her friend or sister feel when she doesn’t share? Empathy isn’t necessarily a natural thing for people, and children will benefit from you talking about it. “Thank you for sharing that toy! That was very nice of you.” “Wow! Thank you for sharing! That shows your sister that you love her.” Reinforce that praise with a hug, kiss, or rub of the back. Let your child know that choosing to share was the right choice. It will be true sharing if your child actually hands over the item rather than you taking it from your child. Give your child some time to give it up. There is a point you will have to remove it if the child won’t give it up, but give your child a fair chance before going there. As adults, we usually call our “sharing” borrowing. When you borrow something or lend something out, find a way to talk about it with your child. Show your child that grown up share, too. Talk about how you feel when your friend shares with you or how you feel when you share with your friend. Give it Time. A Lot of It. It will take time and practice for your child to share. Be patient in the process. When you are going to have a friend over or when you are going to a playdate, remind your child about sharing and talk about why it is nice and how to share (this is the Ask and Tell principle). Your child won’t be a master sharer over night. Give it time and practice. Be patient with your child while he learns to share. Some children are naturally more possessive than others. Every person has natural strengths an weaknesses. There will be things your child is more natural at doing. Practice makes perfect! Hello! This is pertaining to babywise but I was completely unsure if you would receive my question on an old post! My son is 9 weeks old and I would say his schedule is a little rough. I am Nanny and I take him to work with me. We feed at 6am and get in the car at 7:20. When I get to work, I try to get him to sleep until his next feeding at 9 but most of the time I can't, which means one nap is already off, although he does sleep in the car. When I feed him at 9 and 12, I am usually stressing over getting him to sleep. I feel so relieved when he does get sleep, but its not often. But at his 3pm feeding, we are back in the car after 4pm which means that nap is interrupted as well. I'm ready to throw in the towel and allow him to sleep and eat without a schedule because I can't seem to focus enough attention on getting him to sleep during the day. Also, at night he pretty much wakes up on a 3 hour schedule! Is this normal? I want more sleep! Any advice? At his age, waking every 3 hours isn't totally abnormal, but it could be longer stretches. Though I do think with very little nap time in the day, it sounds reasonable. If he sleeps in the car on your way to work, he won't go back to sleep for another nap. Can you get him up later in the morning? At his age, he should be up for only about an hour before nap time starts again. Babies have a hard time sleeping if they are up too long. So he should be going down at 7 am. If you could get him up at 7 and then put him down at 8 when you get to work, that will be more ideal. Thank you for responding. It really means a lot. Hi! We have a big sharing problem with our 2,5 year old. She has a little brother who is 10 months old, and we cant get her to stop taking his toys. Do you have any other posts about this subject? What is a good logical consequense for her when she grabs the toy that he is playing with?